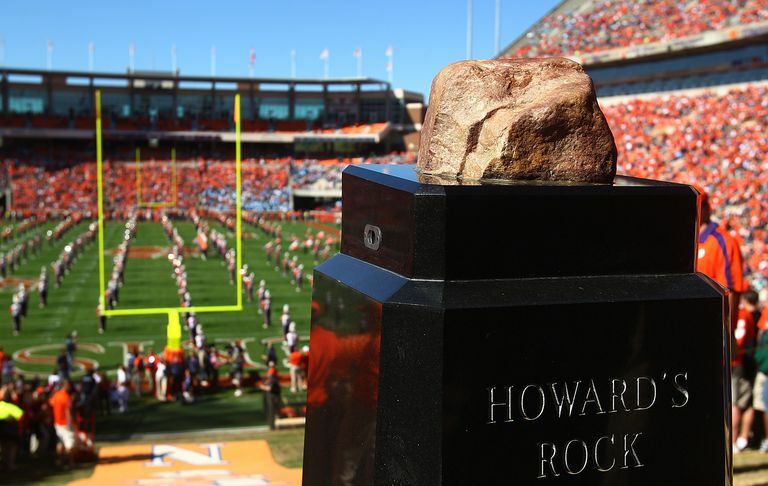 Mounted on a pedestal overlooking Clemson's Memorial Stadium, Howard's Rock is one of the most visible traditions in all of college football. Before each home game, Clemson players gather around Howard's Rock, rub it for good luck, then race down "The Hill" into the stadium known as "Death Valley." The sight of those orange-clad Tigers rushing into the stadium has been called "the most exciting 25 seconds in college football." Howard's Rock is named for legendary Clemson coach Frank Howard who spent 30 years as head coach for the Tigers. Credited with building the team into a national icon, he retired in 1969 and died in 1996. Howard is a legend in college football and in the early 1960s, he received what became known as 'Howard's Rock' from his close friend, Samuel C. Jones. Jones found the two-and-a-half pound rock while traveling through Death Valley, California, and thought Howard might find some use for it back at Clemson. The rock didn't make a great first impression, however, as Howard is said to have used it originally as a doorstop. There, the rock remained until the summer of 1966, when, according to Clemson legend, Howard stumbled across it while cleaning his office. "Take this rock and throw it over the fence or out in the ditch," Howard reportedly told Clemson booster Gene Willimon. "Do something with it, but get it out of my office." Willimon did what he was told. But instead of chucking the rock, Willimon placed it on a pedestal at Memorial Stadium, in a spot where he knew Clemson players would pass. According to Clemson University, Howard told his players in the 1967 season opener against Wake Forest, "Give me 110 percent or keep your filthy hands off of my rock." Clemson clearly won the game with a 23-6 victory and the players earned the privilege for themselves and every future Tiger running down "The Hill." They take it seriously, too. As tailback C.J. Spiller told ESPN.com in 2007, "It's very emotional going up there. You know it's game time when you get on the bus and go up there and rub that rock." Clemson's most bitter rival is the University of South Carolina. Over the years, fans of the Gamecocks have tried to steal or otherwise harm the rock on many occasions. To protect the legendary rock and the school's honor, it is now a tradition for Clemson's Army ROTC to guard Howard's Rock in the 24 hours leading up to every home Clemson-South Carolina game.